>> Stark as 1? Where did you get evidence to support this claim? I don't need no evidences. e.e; I just know! Lets face it. The guy is lazy. Lazy Characters = Normally the strongest. I'm so going to gloat when Stark is proven to be the first. n___n;! WTF THAT LOGIC IS ALL WRONG. And that's just how it is. No questions asked. Lets face it. The guy is lazy. Lazy Characters = Normally the strongest. As I also play the resident lazy shinigami in this group (Kyouraku), I'd just like to say... Whoo! Three cheers for the lazy ones. I think I'm going with the idea of Stark being one of the stronger Espada, that whole lazy thing is just going strong for the guy. It COULD be upside down, but it looks like noitara's number is on his tongue as number 2. I'll keep looking for the rest of the spoiler for 287 and try to translate what I can find. Either 5 or 2. Some of these look like they played with the number, but either way. >_> Okay yeah. it's 5. 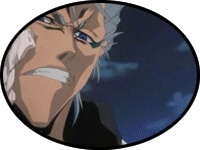 And it looks like at some point they switch back to Ishida/renji. Subject: Re: Espada Number Listings.